The Freeze Dry Area Racking has been designed and manufactured for one of the largest food production companies, based in the Midlands. The Freeze Dry Area Racking features 4 full length shelves, each can fit 5 euro sized containers wide. The main framework has been manufactured from 30mm thin walled mild steel box section with 30mm angle runners for the fixed shelf to sit on, providing an optimum strength vs weight solution. The shelves have been formed up from 2mm mild steel sheet to allow the euro containers to sit on. Each shelf has a rubber inlay to protect the shelves. To one end is a formed 25mm diameter circular hollow section handle allowing the rack to be manoeuvred around. The racking features 4 off 100mm diameter swivel with brake castors. The castors feature a non-marking blue elastic rubber tyre on nylon centred wheel rated at 250kg each. 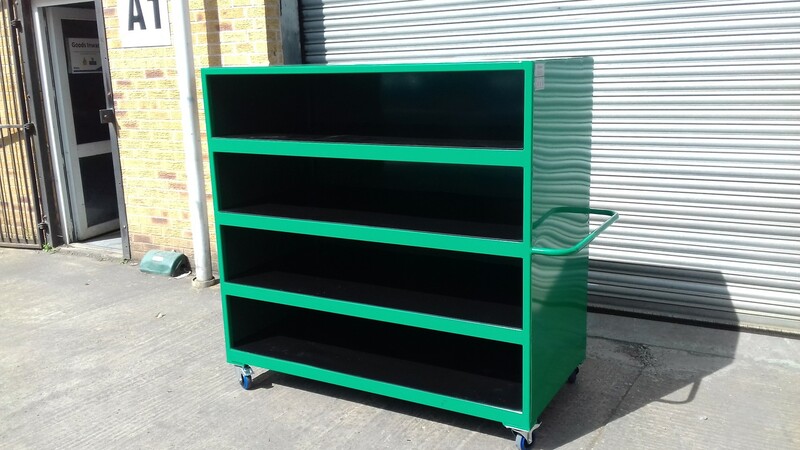 The metalwork has been powder coated in RAL 6029 Green to give a hard wearing durable finish. Approximate overall Dimensions: 1680mm (L) x 780mm (W) x 1520mm (H).